96-Well Chemotaxis / Cell Invasion Assay Combo Kits | Cell Biolabs, Inc. If you are assaying both invasive and migratory properties of your cells, order one of our economic CytoSelect™ Cell Migration / Invasion Assay Combo kits. These kits save you money compared to buying separate chemotaxis and cell invasion kits. Each 96-well combo kit provides sufficient reagents to perform 96 cell migration plus 96 cell invasion assays. 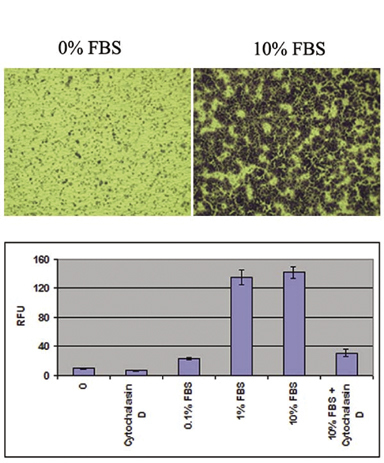 Figure 1: Migration of Human Fibrosarcoma HT-1080 Cells.Cells were seeded at 30,000 cells per well of a 24-well plate and allowed to migrate toward 10% FBS for 4 hours in either the presence or absence of 2µM Cytochalasin D. Migratory cells on the bottom of the polycarbonate membrane were stained (top) or quantified in a fluorescence plate reader (bottom). Sharma, N. L. et al. (2014). The ETS family member GABPα modulates androgen receptor signalling and mediates an aggressive phenotype in prostate cancer. Nucleic Acids Res. 42:6256-6269. Zecchini, V. et al. (2014). Nuclear ARRB1 induces pseudohypoxia and cellular metabolism reprogramming in prostate cancer. EMBO J. 33:1365-1382. Ardiani, A. et al. (2014). Vaccine-mediated immunotherapy directed against a transcription factor driving the metastatic process. Cancer Res. 74:1945-1957. Sharma, N.L. et al. (2014). The ETS family member GABPa modulates androgen receptor signaling and mediates an aggressive phenotype in prostate cancer. Nucleic Acids Res. 10.1093/nar/gku281. Axlund, S.D. et al. (2010). HOXC8 Inhibits Androgen Receptor Signaling in Human Prostate Cancer Cells by Inhibiting SRC-3 Recruitment to Direct Androgen Target Genes. Mol. Cancer Res. 8:1643-1655 (#CBA-106-C). Alfano, R.W. et al. (2009). Matrix Metalloproteinase-Activated Anthrax Lethal Toxin Inhibits Endothelial Invasion and Neovasculature Formation during in Vitro Morphogenesis. Mol. Cancer Res. 7:452-461 (#CBA-106-C). Eckstein, N. et al. (2008). EGFR-Pathway Analysis Identifies Amphiregulin as a Key Factor for Cisplatin Resistance of Human Breast Cancer Cells. J. Biol. Chem. 283:739-750 (#CBA-106-C).